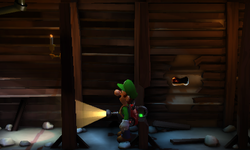 The Secret Pocket is a room in the Gloomy Manor in Luigi's Mansion: Dark Moon. This room is accessed by removing the wallpaper between the Lab and the Studio in the Common Hall. This reveals a hidden room that takes Luigi into a narrow room with piles of junk and a hole that peers into the Studio. During A-2: Gear Up, the Secret Pocket holds a key that is needed to unlock the door to the Master Hall from the Foyer and three coins. In other missions, the key and the coins are not present. Peering into the Studio during the same mission shows two Hiders, one painting on the canvas and another one posing. This page was last edited on May 1, 2017, at 21:03.